The Unemployment Insurance Notice to Workers (Spanish) is an unemployment law poster by the Utah Labor Commission. This poster is mandatory for some employers, including all employers who employ spanish speaking employees. This poster, written in Spanish, must be posted in a conspicuous place by all employers so that all Spanish speaking employees can see it. This poster describes how to qualify for unemployment, how the amount of unemployment paid is determined, where to file a claim for unemployment insurance benefits, and important information that employers need to know. UT All-In-One Labor Poster: Instead of printing out dozens of posters, employers can also purchase an all-in-one poster that covers both Utah and Federal poster requirements by clicking here . It appears you don't have a PDF plugin for this browser. Please see the link below to download utah-09-22s.pdf. por cuatro (4) años de calendario. costos potenciales en beneficios a su compañía. evitar cargos al no pagar sus contribuciones (impuestos), intereses, y multas. un lugar apropiado (tales como pizarras informativas y cerca de relojes para marcar horas, etc.) en cada área de trabajo y establecimiento. de Seguro de Desempleo son pagados por su empleador. No se hacen deducciones de sus sueldos. trabajo disminuyan a menos de tiempo completo. información explicando la razón por su separación. s, comisiones, bonos, propinas, y el valor en efectivo de bienes y servicios recibidos por su trabajo. eneficios de Seguro de Desempleo. y /o sordera pueden marcar el número 711 (Relay Utah). Para asistencia en Español, marque el número 1-888-346-3162. There are an additional five optional and mandatory Utah labor law posters that may be relevant to your business. Be sure to also print all relevant state labor law posters, as well as all mandatory federal labor law posters. 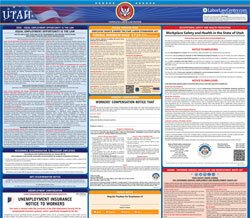 Instead of printing out pages of mandatory Utah and Federal labor law posters, you can purchase a professional, laminated all-in-one labor law poster that guarantees compliance with all Utah and federal posting requirements. Fully updated for 2019! While we do our best to keep our list of Utah labor law posters up to date and complete, we cannot be held liable for errors or omissions. Is the poster on this page out-of-date or not working? Please let us know and we will fix it ASAP. LaborPosters.org will email you a printable PDF of this Utah labor law poster, 100% FREE. You'll also get notified when new posters are available. Your Utah poster has been downloaded and emailed! This poster download is provided as-is, with no warranty or guarantees. Please verify with Federal and Utah authorities to confirm that you are posting all of the correct (and updated) posters required for your type of business. Instead of printing out pages of mandatory Utah and Federal labor law posters, you can purchase a professional, laminated all-in-one labor poster.